Recent years have seen increasing interest in the study of Oldowan technological variability, and the observed inter-assemblage diversity has been attributed to a number of causes, including raw material availability, different hominin species, and cultural and diachronic variation. This paper explores technological variability through the study of Naiyena Engol 2, an Oldowan site dated at c.1.8–1.7 Ma and located in the Nachukui Formation of West Turkana, Kenya. Site formation processes, stratigraphic and taphonomic aspects of Naiyena Engol 2, are reported and are followed by a discussion of the lithic assemblage, focusing on flaking techniques and battering activities. 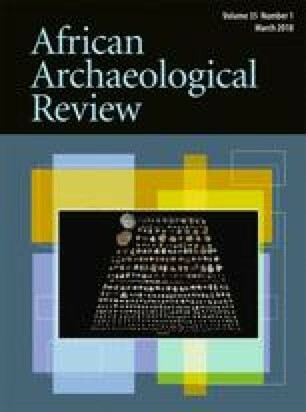 Our results show important diversity of flaking techniques within the same assemblage, suggesting that lithic variability is not only an inter-site phenomenon but also may be found within single Oldowan sites. Additionally, the overall low flake productivity of Naiyena Engol 2 is in sharp contrast with patterns observed in other West Turkana assemblages such as Lokalalei 2, thus also supporting the existence of significant inter-assemblage variability during the Oldowan. The online version of this article ( https://doi.org/10.1007/s10437-018-9283-5) contains supplementary material, which is available to authorized users. Au cours des dernières années, l’intérêt pour les études de la variabilité technologique de l’Oldowayen s’est accru. La diversité inter-assemblage, maintes fois observée, est attribuée à différentes causes telles la disponibilité des matières premières, la diversité hominienne, ou encore les variations culturelles ou diachroniques. Cet article explore la variabilité technologique à travers l’étude du site Oldowayen de Naiyena Engol 2, qui appartient à la Formation de Nachukui et est daté entre 1.8 et 1.7 millions d’années. La stratigraphie, les principaux aspects taphonomiques et de formation du site et l’ensemble du matériel archéologique sont présentés, suivis par une discussion sur l’ensemble lithique, axée sur les techniques de taille et autres activités de percussion. Nos résultats montrent une importante diversité dans les techniques de taille, suggérant que la variabilité lithique n’est. pas seulement un phénomène inter-sites, mais peut aussi être mise en évidence dans un seul et même ensemble. De plus, la faible production d’éclats à Naiyena Engol contraste fortement avec celle observée dans d’autres sites–dont le site plus ancien de Lokalalei 2C–suggérant aussi une forte variabilité inter-assemblage au cours de l’Oldowayen. Permits to work in West Turkana area were granted by the Office of the President and the Ministry of Home Affairs of the Government of Kenya, with the support of the National Museums of Kenya. Excavations at NY2 were funded by the French Ministry of Foreign Affairs and the CNRS. The analysis of the NY2 assemblage was funded by a Leverhulme Trust project (IN-052) and the French National Research Agency (ANR-12-CULT-0006).